Today's Throwback-Thursday: A NYC Adventure! My hubby and I traveled to New York City to surprise a friend for her 30th - LOVE YA, VICK! If you didn’t already know, I’m a baked goods FIEND. NYC has some of the best ones around. We stayed in Soho; we stuck around there and the Lower East Side most of the time. Clinton St. Baking Company – Vicky and I ate here over five years ago when I visited her there. Their pancakes are AMAZING. Like they put crack in them. I dragged hubby here and he (sacrilegiously) ordered an omelet with hash browns. The hash browns were deelish too. Get there early or be prepared to wait; we had to wait 45 minutes for a table around 9:45am. When we left, the wait was an hour and 15 minutes. Wait across the street in a super-cute Moroccan café, Pause Cafe. You can get fresh juice or a wheat-grass shot there before you succumb to diabetes. Prohibition Bakery – This is a place dear to my heart. 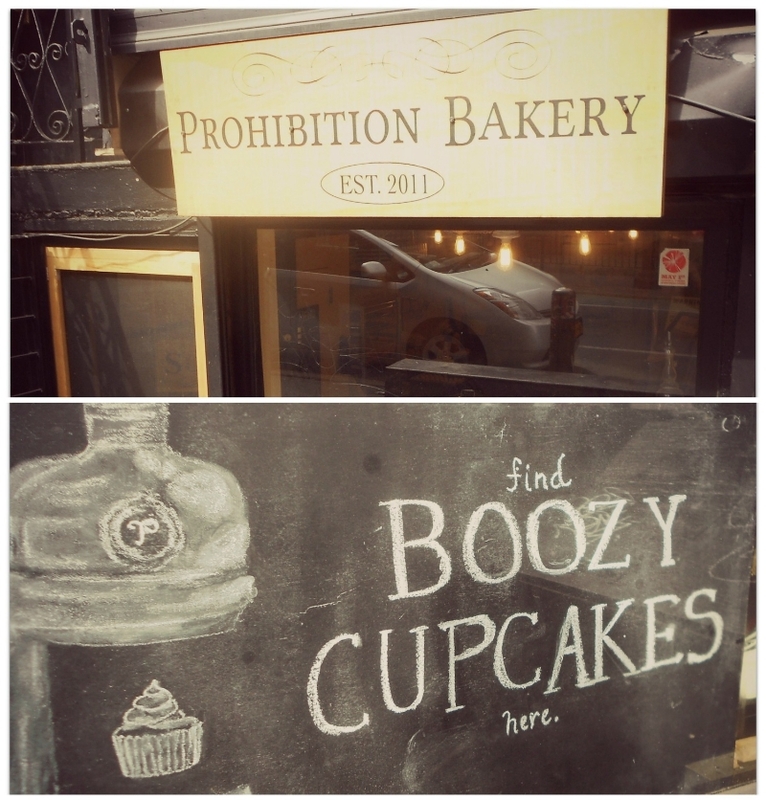 Quite literally across the street from the Clinton St. Baking Company, this bakery serves only boozy mini cupcakes. Each is named after a Prohibition cocktail. We sampled the Old Fashioned and the Bees Knees – both were good, although I think the Old Fashion was better and packed a punch. It was a small operation, but had a lot of charm. I chatted with the owner a bit – I would love to have a storefront like that someday! Babycakes – This was my second visit to Babycakes! They are a gluten-free/vegan bakery. I even own one of their cookbooks. Their vegan doughnuts are phenomenal and we sampled a vegan apple churro...it’s as good as it sounds. Doughnut Plant – The DP came highly recommended from New Yorkers, so I had to visit. They’re known for their crème brulee doughnuts and their square, filled doughnuts. They. Were. Delectable. Dominique Ansel Bakery - You may have heard of this place because of its Cronut fame, but we didn't want to wait in line for one at 6:30am. So we "settled" for a salted caramel pastry...which was fabulous. Brinkley’s Broome St. – Great bar atmosphere and even vegetarian friendly! They have a veggie BLT and an eggplant/chickpea burger. I got the burger; it was delicious, but HELLA spicy. Brinkley’s has great drinks too – my hubby and I love great cocktail menus! Schapiro’s, Lower East Side – Great cocktails and their pasta dishes are sooooo good! Papabubble, Soho – They make their own candy on site! Two women were pulling the candy and offered me a sample when I walked in; it had great flavor. Although it looks like your grandma’s hard candy, don’t let looks fool you. I bought a bag of lemon ginger candies and they are a great pick-me-up in the middle of the work day. The Sohotel – Hubby and I stayed here. It had the typical NYC shoe-box rooms, but one should expect that in NYC. It was a GREAT price and very clean. The Sohotel was within walking distance of all of these places listed above, not to mention Little Italy and Chinatown. Well, that’s the end of my recommendations! If you end up in NYC and visit any of these places, leave a comment below; I’d love to hear how your trip was!